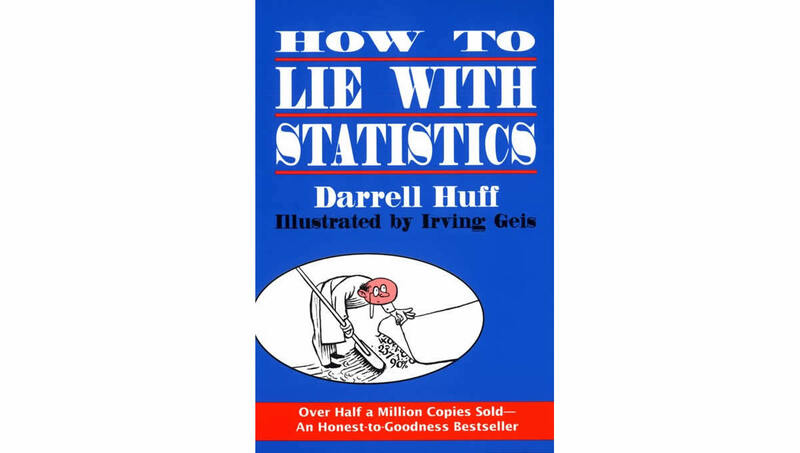 How to Lie with Statistics, written by Darrel Huff, was first published in 1954. The book is more than relevant, 64 years after it was published. 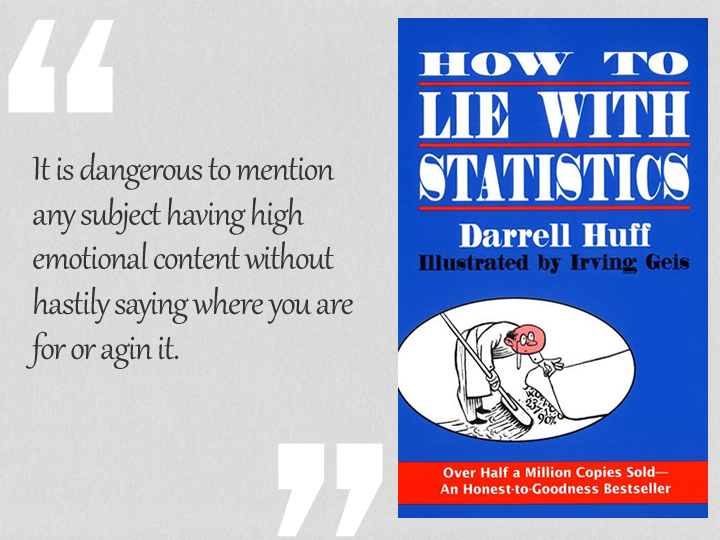 Darrell Huff states that statistics can be used to trick people and can be easily interpreted wrongly. But statistics is also a valid and useful necessity in order for us to make sense of our life. The book takes us through various tricks in statistics from built-in biases to misrepresentative samples to miscalculations. The language of statistics is employed to create sensation, to inflate and to oversimplify. Without writers who read and write and readers who can make sense of the data, the result of statistics can be pretty meaningless. Huff warns us that samples can be trusted only they are statistically significant. Hence to be worth much more, a report or analysis based on sampling must use a representative sample, and for it to be relevant every source of bias is removed. In a world where facts do not matter and where we are all swimming with the waves of “statisticulation”, How to Lie with Statistics brings freshness to our brain and allows us to understand how we should challenge statistics, eliminate bias and understand the information which is being thrown at us every second. The secret language of statistics, so appealing in a fact-minded culture, is employed to sensationalize, inflate, confuse, and oversimplify. Statistical terms and statistical methods are necessary in reporting the mass data of social and economic trends, business conditions, ‘opinion’ polls, the census. But without writers who use the words with honesty and understanding and readers who know what they mean, the result can only be semantic nonsense. It is not necessary that a poll be rigged – that is, that the results be deliberately twisted in order to create a false impression. The tendency of the sample to be biased in this consistent direction can rig it automatically. It is dangerous to mention any subject having high emotional content without hastily saying where you are for or agin it. To say ‘almost one and one-half’ and to be heard as ‘three’ – that’s what the one-dimensional picture can accomplish. If you can’t prove what you want to prove, demonstrate something else and pretend that they are the same thing. In the daze that follows the collision of statistics with the human mind, hardly anybody will notice the difference. It is an interesting fact that the death rate or number of deaths often is a better measure of the incidence of an ailment than direct incidence figures – simply because the quality of reporting and record-keeping is so much higher on fatalities. Another fertile field for being fooled lies in the confusion between percentage and percentage points. If your profits should climb from three percent on investment one year to six percent the next, you can make it sound quite modest by calling it a rise of three percentage points. With equal validity you can describe it as a one hundred percent increase. For loose handling of this confusing pair watch particularly the public-opinion pollers. 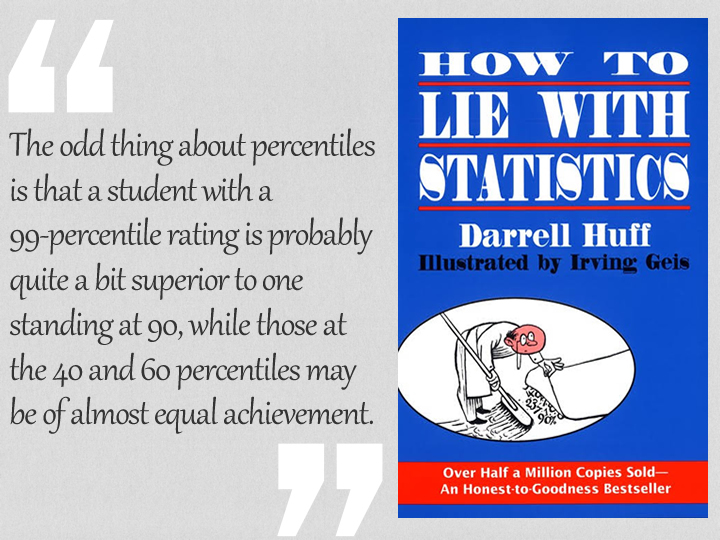 The odd thing about percentiles is that a student with a 99-percentile rating is probably quite a bit superior to one standing at 90, while those at the 40 and 60 percentiles may be of almost equal achievement. The fact is that, despite its mathematical base, statistics is as much an art as it is a science. A great many manipulations and even distortions are possible within the bounds of propriety. Often the statistician must choose among methods, a subjective process, and find the one that he will use to represent the facts.